The Avolite Pearl 2004 combines compact dimensions with plenty of power, offering full moving light control for up to 240 intelligent fixtures. As with all Avolites consoles, the Pearl is designed for quick and easy programming and playback. The patching of moving lights and colour changers is also as simple as patching a dimmer. The Avolite Pearl 2004 retains the intuitive and familiar feel of the "roller", use of high quality Faders, Schadow switches and legendary reliability of Avolites consoles. The new Avolite Pearl 2004 , coupled with the award winning Graphics Tablet allows the user optimum speed and creativity. Front panel now reverse printed Poly Carbonate Laminate using technology from the Diamond 4, this is incredibly hard wearing and looks excellent. Front panel printing updated to include the various new functions introduced in software revisions since the introduction of Pearl 2000. New improved feel Playback and Master faders. The same faders are used on the Diamond 4 and Sapphire 2000 mastering. Newly styled end cheeks finished in a tough grey and metal impregnated paint. Newly styled roller laminate in Silver and Black. New Two Speed silver slim encoder knobs, as used and designed for Diamond 4. White and Grey fader knobs used throughout. 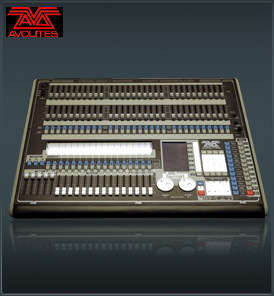 Output panel now has 4 DMX XLR connectors, as used on the Sapphire 2000. Each console individually has an electronic serial number, linked to physically engraved metalwork numbering making reselling of stolen consoles more difficult. Supplied with or ready to install Pearl 2004 software, this includes new personality files containing table information for many fixtures making programming of complex fixtures very simple. Supplied with PC applications: Avolites Visualiser, Pearl Simulation program and Cache Builder.